That picture of Sasha kissing her dad on the screen is just sooo cute!! I had never seen that one before!! Daddy's litte girl, both of them. Adorable. 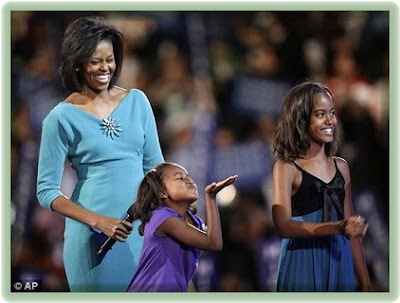 I remember seeing Malia do a little remarkable hop skip onto stage one evening. I love the Obama Family.